Join the Bitterbrush Broads and Oregon Wild for a special event featuring Storyteller Susan Strauss. Susan will present ancient stories from world cultures that pre-date the Dark Ages of Europe and the advent of such misleading tales as “Little Red Riding Hood”. The purpose of the evening is to be inspired by this ancient wisdom to write letters objecting to the Trump Administration’s proposed delisting of the wolf from the Endangered Species List. Ancient world myths reveal the wolf’s true archetype as devoted parent, essential predator, spirit of strength and guardian of mystery. Stories may include: Skidi Pawnee Creation, “Wolf’s Eyelashes” (Japan), “The Wolf & The Firebird” (Russia), “Chase the Sun & Moon” (Norse) as well as anecdotes from noted wolf biologists and the farce, "Little Red Riding Boots Moves To L.A.”. SUSAN STRAUSS is internationally recognized as a storyteller, keynoter, and for her signature, "Passionate Fact Workshops: Storytelling Science." Performances include: Smithsonian Natural History Museum, US National Park Service, Monterey Bay Aquarium, Royal Botanical Gardens Edinburgh, National Geographic Society, National Gallery of Art and the Oregon Symphony. She is the author of four books including: Wolf Stories: Myths & True Life Tales. 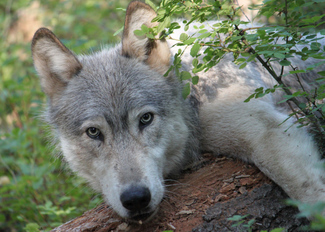 National Park Service featured her in a film on the wolf in mythology used in Yellowstone NP. RSVP is required - please sign up here.